The completed HPJC outline will be filed under pdfs to the right of the blog — I have improved it a little with your feedback, and will post the newer one later today, so wait a bit before downloading. 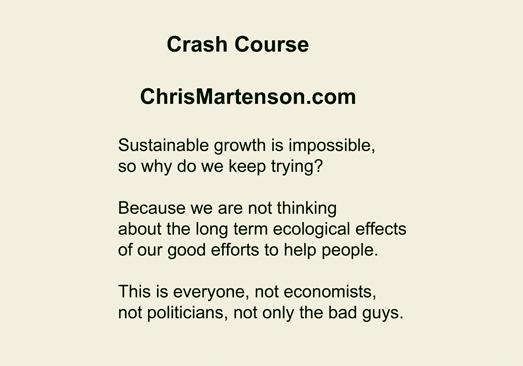 At approximately 33.12 (playing time) of disc three, Martenson overlays the three graphs that show a) peak oil, exponential growth now leveling off; b) economic growth, exponential growth now leveling off; c) population growth, exponential growth, now leveling off. He suggests the possibility that our current lifestyle has very little to do with our fine economic model, but is almost entirely the result of the availability of organic energy that was laid down in the prehistoric past by the fossilization of organisms. He points out that the oil boom is now on the downside, and no more gas and oil are being created. Then he goes through a list of other resources that we have similarly begun to use up. A recent book by Richard Heinberg (Peak Everything) makes a similar point, and their opinions are backed by good, valid statistics (see also Earth Policy Institute). I think we need to believe the statistics if we want to behave in a positive fashion. There is no point nit-picking the details when we could be doing something about the overall reality. So the remaining question is what to do about it, that we can do. Petitioning the President will not resolve this kind of problem, because we can not change the power base of Mother Nature nor the way she flows energy through the ecosystem (to understand this, you should download the pdf at the right side of this page, Bare Bones Ecology. The bottom line is the energy that we can use (including gas and oil) is organic energy and it comes from organisms. We can’t make energy. Therefore, if we choose to respond to our challenge, we will have to respond using the only power that we do have — the power to change our own behaviors. That would be a very good thing to talk about. Slide Number Thirteen-Sustainable growth is an oxymoron. That means it is impossible. The result is that people are starving because the earth ecosystem gets all of its energy from plants. And once we hit the maximum that the plants can give — that’s the maximum they can give. I will not reference an extremely disturbing recent PBS discussion of the population problem that suggests we can resolve this dilemma by more growth. NOVA should stick with physics if they don’t understand biology, or even common sense. It is not possible to solve a problem by doing more of what caused the problem in the first place. Slide Number Fourteen– Photograph by Zoriah. This picture was taken in Haiti, before the earthquake. The woman is making cakes of sand and clay and salt. To Eat. 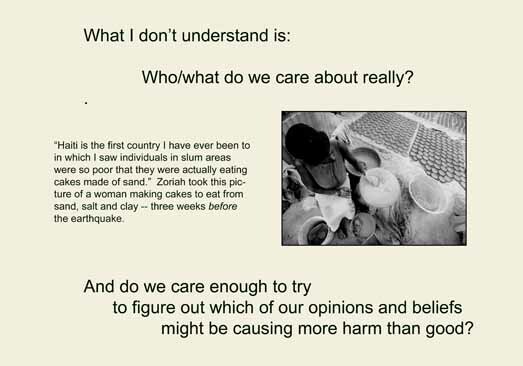 And my question is: Why do we care about the woman now, and we didn’t care before the earthquake? Is it because now is easier — we can feel like heroes — and before was only a downer to think about people in these conditions. Well — people are living in these conditions, whether we think about them or not, and it will continue to get worse and worse so long as we continue to do the behaviors that caused the problem in the first place. I say it is not heroic for us to create conditions that cause other people to face starvation — and then rush in to save a few of them from starvation, but certainly not from a life of suffering (earthquake or no earthquake). 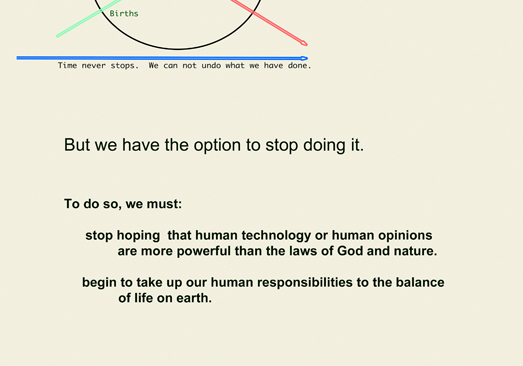 I say it is not heroic to bring babies into the world — only to kill them off when they come of age. And worse, to live in a culture that rejoices fervently and openly and incessantly in the killing. I say we should do something that is heroic. Nothing stops us from thinking about what we do and learning how it really affects the whole earth ecosystem — before we do it. I say we should do something that is REALLY heroic and discuss these issues with all our friends and all our enemies. Try it some time. You will be amazed at the array of hostile and evasive responses — is this heroism? I say yes. Doing what is easy and people love you for it is not heroism. We need a lot of real heroes. And I said discuss, not debate. I’m talking about actually trying to find a solution. Winning arguments does not solve problems, it just makes new ones. And the solution will have to be a change in our own behavior, because we can not change Mother Nature, and technologies are not resources. This is a problem of human behavior in response to an absolute limit of energy-related resources. Technologies can not change the fact that resources are limited. And then call the President.